We have been lucky to have customers from early on. Actually, we have been incredibly lucky because our customers have given us valuable feedback. For example, it was through customer feedback that we learned “real-time” is often an alias for “interactive”. Several weeks ago, we were talking to one of our customers. They had been test-driving our service for a month and liked our product in general. 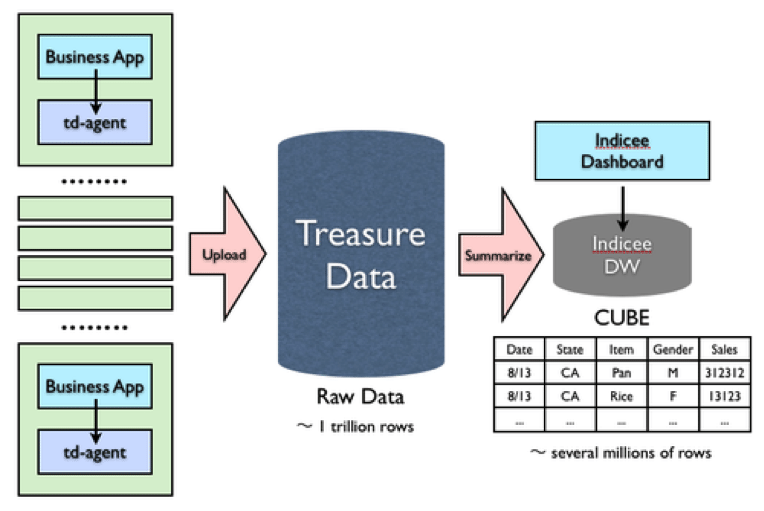 However, they had one request: they wanted Treasure Data to be more real-time. They told us their business analysts weren’t psyched about Treasure Data because they could not explore data in real-time. Every time their analysts wanted to ask a new question about the data, they had to write Hive queries and wait for the jobs to run. And as our informed readers know, Hadoop takes anywhere between 15 and 60 seconds to set up MapReduce jobs. 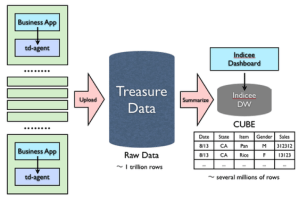 Treasure Data is no different in this regard. Where we shine is batch-processing petabytes of data. But then, we asked them how close to real-time they needed their data. Is a five-minute delay acceptable? One minute? Below one second? To our surprise, they said they were satisfied with the freshness of data that Treasure Data was already offering. But they reiterated that they wanted to slice and dice their data in “real-time”. Hold on. What they are asking for, then, is not seeing new data every second but interacting with their data without waiting for MapReduce jobs to complete. We could do this by just aggregating data in multiple dimensions and storing them locally on the customer’s database. With all the necessary piece of information in their database , the customer can look up and visualize key metrics interactively because now the customer just looks up values in a local database and performs simple operations on those values. Once we had this epiphany, all the pieces fell into place for us. We began tinkering with cloud BI tools to integrate them with our backend. Such integrations allow our customer enjoy the best of both worlds: a beautiful, interactive BI tool with a powerful scalable backend. Our integration with Indicee, a leading cloud BI platform, is one step in this direction. We’ve written up about using Indicee with Treasure in our documentation. Customer feedback is invaluable: at the end of the day, we are here to make our customers more productive. When they have something to say, listen to them carefully. Customers may speak a different language from yours: in our case, it turned out our customer meant “interactive” by “real-time”. Listening passively to customers may mislead you. Engage them in a dialogue. Collaborate and complement: we decided to partner with Indicee because by teaming up with them, we can play to each other’s strengths. Many companies try to build an end-to-end solution on their own. However, if a partnership makes sense, there is no reason not to integrate with other services to deliver a better service more quickly to our customers. Have you also experienced customer feedback helping you think through and evolve your product? We would love to hear about your experience. This is still much, much smaller than the raw data because data have been aggregated in several different dimensions. It turns out we were already offering this capability, just not with any BI tools.